The Nosy Gamer: How Many Subscriptions Does EVE Online Have In 2015? How Many Subscriptions Does EVE Online Have In 2015? Sometimes, subjects come like bolts out of the blue. Take, for instance, EVE Online subscription numbers. CCP stopped releasing the subscription numbers for Tranquility in May 2012. Since then, many players, including myself, have attempted to divine the number. But after a couple of years, the trail grew cold and most lost interest. Which is why last week was so remarkable. "Eligible voters cast 36,984 votes, meaning that we have 15% increase since the last year’s election. We have also noticed a 3% turnout increase since last year and it’s a nice trend that we hope to keep for the next election as well." Mike Azariah, math teacher that he is, wrote a post based on the information released by CCP Leeloo, proving mathematically that the pool of eligible voters, and thus accounts, increased by 14% over the past year. But that doesn't sound right either. We'll blame Mike's mistakes on the fact he's recovering from surgery and his brain's still a little fuzzy. But we do now have numbers to play with. Since the difference in 2012 between eligible subscribed accounts (greater than 30 days old) and ineligible accounts (less than 30 days old) was less than 2% (5000 accounts) in 2012, I'll assume no difference for this post due to all the assumptions I will make. Last year, Ripard Teg did an analysis post on the CSM 9 election returns and came up with the useful chart below. Ripard determined that the probable number of subscriptions during the CSM 9 election was approximately 380,000. That figure assumed an approximate 5% decline in subscriptions from 2013 to 2014. His logic seemed reasonable at the time and, having reviewed his article, still seems sound. As a reality check, the average percentage turnout for the first nine CSM elections was 11.2%. So an estimated 11.2% turnout for the CSM 10 election is totally within the realm of possibility. Now, I don't want anyone to thing that everything is humming along smoothly, because even the mid-point figure represents an 18% decline in the number of subscriptions over the past 2 years. As the last graph from MMOData.net shows, EVE Online most likely is back to the level of subscriptions it had back in 2010. What about the figure of 146,000 subscriptions sited by ShadowandLight? I think someone is trolling him, playing on the fact that Shadow has claimed that the number of EVE subscriptions has severely declined ever since the beginning of the input broadcasting/ISBoxer controversy started back in November. The figure given fits so well into Shadow's world view that he didn't even think to question its validity. Let's apply the smell test to the information "leaked" to Shadow. If true, then the turnout for the CSM 10 election was 25.3%. Does anyone think that figure is realistic? I can't find the chart Ripard created yesterday, but if the number is indeed that low, then given the information released by CCP Leeloo, EVE Online gained subscribers over the past year, not lose them like the figures show. But the biggest strike against the 146,000 subscriber number comes from Eve-Offline.net. While Chribba no longer provides his famous average concurrent user graph, I was able to make graph below. While I don't like using the peak concurrent user numbers since it basically excludes attempting to look at participation in the Australian time zone, the PCU went from approximately 56,000 around the time of Fanfest 2013 to around 43,000 on Sunday. The 23% decrease in players in space correlates fairly closely to the 18% drop in subscriptions using Ripard's calculations from last year plus the information provided by CCP Leeloo give. The 146,000 subscription figure represents a drop of approximately 64% in subscriptions over two years. I just don't see the PCU numbers supporting such a claim. Perhaps I'm a bit unusual. In my work on writing about botting and illicit RMT, I rarely have official figures to rely upon. Sure, CCP provides the figures two or three times a year, and other companies will sporadically provide information when they conduct a major operation. So I go out and dig up my own. I'm not some media type that sits back and expects the authorities to spoon-feed me the information. And when the subject is the number of subscriptions, companies other than Blizzard rarely publish that information. So, we get to do math instead. Well, based on the 2013 financial statement CCP "ended the year with over 500,000 subscribers." Those statements were signed off on 14 March, so I would expect we should be seeing the 2014 edition fairly soon. Since CCP isn't a public company it will be interesting to see how they choose to word it this time around, if they even do. If I recall, the interim statement as of June 2014 was rather vague in that regard. It would be so much better for them to be transparent. We all know the numbers are down. Let's see how they handle it. The more vague they are, the more prone they become to wild speculation. This certainly matters for CCPs wallet, but I'm wondering how much effect this is actually having on our experience in space. I think a bunch of cyno alts have gotten unsubed since Phobe and I'm sure some IS boxer trash has left the game. I'm sure there are capital alts that are currently unsubed waiting to see what happens with caps. As a player I don't see the cyno alts or the IS toons as a loss. I wasn't getting any content from them anyway. Hopefully the sov changes will be good and caps will find a fun and useful role, and we will see subs rise, but I don't think that much of the loss that we've seen over the last year has been a bad thing for actual game play. Stop saying things that make sense and just admit that eve is dying. Resistance is futile, you will be assimilated! How about 146,000 subscribers (people) paying up to 342,000 susbcriptions (accounts)? An average of 2.34 accounts per player sounds pretty sensible to me. Given Shadow's track record, he could have been given the scoop everyone's dreamed of and managed to screw it up. But that's not what he said. It was presented to me, word for word, as "146k paying subs". Now, is that "real people", is it "pre-paid" accounts using paypal or CC's or is it just a plain lie? Who knows except CCP! What they can't fudge or obfuscate is revenue. Cash flow ultimately is all that matters. So we should know in a matter of weeks what kind of situation CCP is in. The one change that people seem to be missing is the mass exodus that started when high sec industry was gutted for the benefit of the null sec cartels. Okay. Someone trying to tell you 146K subscriptions. This is where CCP Hellmar shouted 500k world wide subs ! For 2015 we get eligible voters cast 36,984 votes, meaning that we have 15% increase since the last year’s election. We have also noticed a 3% turnout increase since last year and it’s a nice trend that we hope to keep for the next election as well. What CCP could have meant was a Total eligible voter increase of 3% x 15% increase in turn out of voters = 1.03 x 1.15 = 1.18 = 18% increase of amount of cast votes. I don't know that it matters so much. 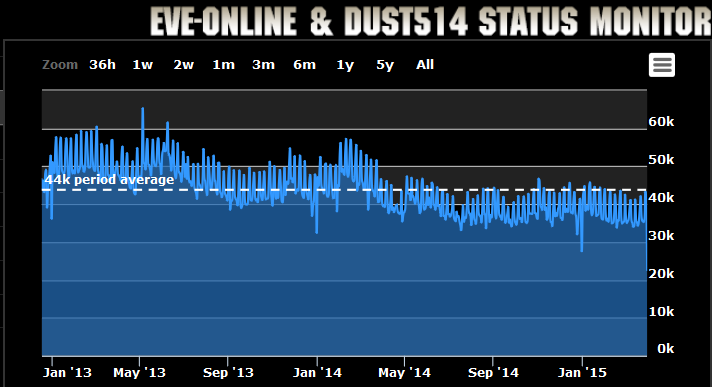 Dust has supposedly finally turned a profit after 2 years. Tranquillity continues hovering around 300k, and Serenity around 150k. Valkyrie is currently a hole in their portfolio but I see no reason to think they won't recoup the tiny, comparatively speaking, game development cost they've tossed into it within a month or less of it going live unless something comes out of nowhere to steal it's thunder. And finally, they've got some interesting alternative revenue streams with physical goods that they've been trickling out slowly but regularly over the last year. CCP is doing well right now, probably the best they've ever done. The Eve IP is doing well, probably the best it's ever done. I think we're going to pass a point in the next few years where flat subscription numbers don't matter as much as they used to. Oh come on. 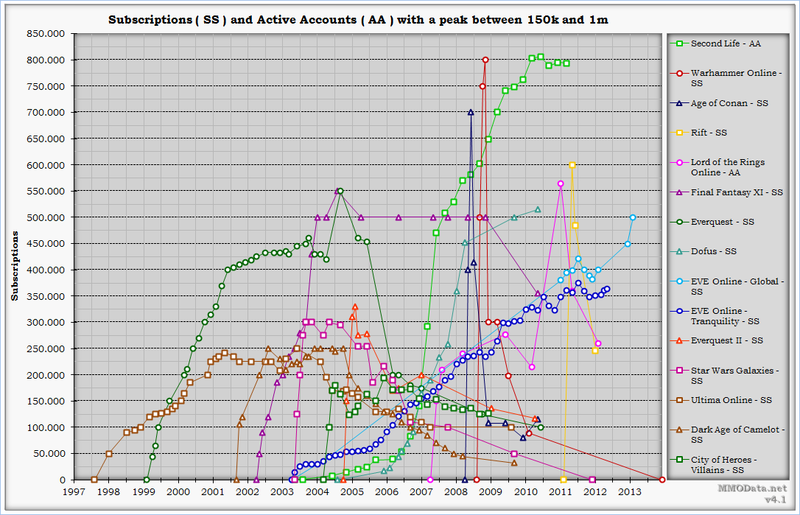 Financially speaking, 2011 was CCP's best year by a long stretch. And 2014 the worst ever with the derecognition of WoD. As for how well is doing EVE... picture a bonfire that's been burning for long... most logs already burned and what's left are just embers... then someone pours gasoline on the bonfire and it burns better than ever. I stand by Ripard Teg's words last year: CCP Seagull is trying to pull a last run to the fences, but she won't succeed. It's not enough, and it's too late. And as usual CCP ignores the elephant in the room, the people who never paid CCP to play pew pew online and who are, by every known measure, a number high enough to kill CCP on the spot if they stopped paying. The number of tranquility subscriptions vs actual number of subscribers (persons) is a metric we hardly have seen by CCPgames. The best way to get reliable numbers on that is to do representative survey on reddit, eve forums etc, and then do a statistical analysis. I do not doubt what you have heard, you believe is true. I hear lost of stuff everyday to, even the newspapers tell me stuff that's supposedly true. But with giving the source of the information it is easier to fact check or compare other interpretations or ask follow through questions. Your math is wrong because you should not be including the 15% increase in raw numbers. I believe my math is good, but it is still based on Ripard Teg's supposed 8,2% high turnout number in 2014. He even mentioned it: "I've chosen to go with the higher turnout number"
"Given how poor a job CCP did with getting the CSM8 minutes out the door, my personal take on this election is that turnout will be at an all-time low." Remember when CCP Dolan answered my question; "where are the minutes ?" So the 8,2% voter turnout number could be way to high, and we are basing the math on a wrong assumption. In 2014 subscribers were not running to the voting booths: "A total of 937 votes were cast to determine the new (dust514 cpm1) council"
It's even hard to draw a conclusion about high the account numbers are based on log ins, due to capsuleers playing skill training online, etc. What ever the current number is for total subscribers and alt avg per person, we can better look at how CCPgames behaves. And atm it's mostly about getting former capsuleers back into the game. PS: that reminds me to ask, is CCPgames actively pursuing a reduction in avg alts per person, or should we wait for fozzie sov to answer that question ? I missed this earlier. But the reason I took the high number is that the Chinese cannot vote for the CSM. The low estimate included all subscriptions, both Tranquility and Serenity. Last official number I heard (2013?) was around 1.3 accounter per player. 2.3 is way to high if you calculate in how many highsec people just do missions or mine with there one account.